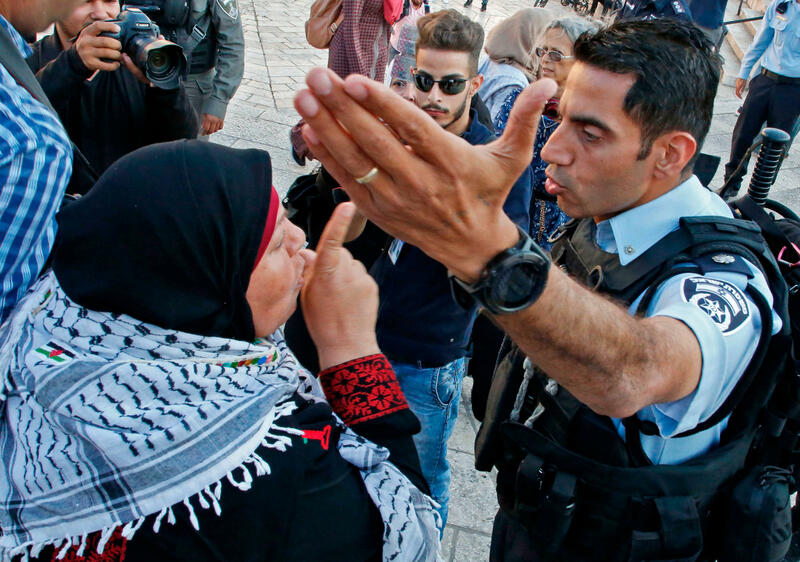 A Palestinian woman argues with a member of the Israeli security forces as they disperse a demonstration outside the Damascus Gate in the old city of Jerusalem on Tuesday. 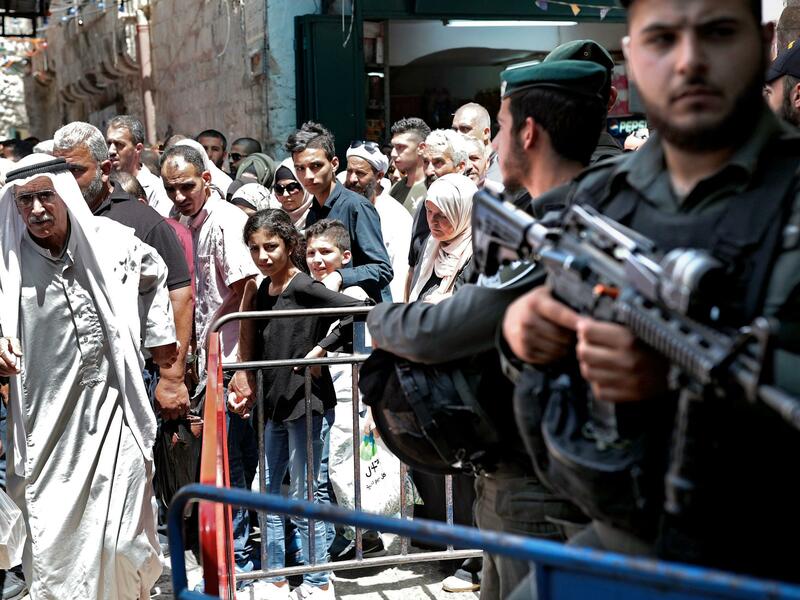 Israeli police stand guard in the main street of the Muslim Quarter of Jerusalem's Old City after Palestinian worshippers at Al-Aqsa Mosque took part in the first Friday prayers of the holy month of Ramadan. In Jerusalem on Monday, hundreds of American and Israeli dignitaries gathered around a specially built stage at the newly designated embassy, while diplomats from most of the world stayed away. In Gaza, thousands of Palestinians approached — and in some places, stormed — the border fences that surround their small territory, and Israeli troops opened fire. Gaza health authorities said at least 60 Palestinians were killed and more than 1,300 suffered gunshot wounds. An NPR team visited both Jerusalem and Gaza and came away with six observations. Think of them as six "buts" — where a statement is true, but so is a contrasting statement. 1. The United States says Jerusalem is still up for negotiation — but Israel doesn't. In moving its embassy, the United States supported Israel's claim to Jerusalem. The city has been divided since Israel's founding in 1948. Israel has controlled it all since a war in 1967, but its final status is supposed to be resolved through negotiations, the U.S. says. Palestinians want part of the city — or all of it, depending on whom you ask — for their own capital. While U.S. officials say the borders have yet to be determined, Israel says otherwise. At the embassy opening, Prime Minister Benjamin Netanyahu repeated his government's view that Jerusalem is the "eternal, undivided capital of Israel." 2. Jerusalem is disputed between Muslims and Jews — but don't forget that other religion. For American evangelical Christians, who form much of President Trump's political base, Jerusalem is more than a distant foreign policy issue. They support Israel's right wing, which opposes a Palestinian state. At the U.S. Embassy opening Monday, religious figures onstage included an ultra-Orthodox rabbi and two American evangelical pastors, Robert Jeffress and John Hagee. (There was no Muslim cleric.) Although many Palestinians are Christian, they were absent from the event. "American Christians may be even more excited than Jews," Emma Green wrote of the embassy opening in the Atlantic. Some believe the return of Jews to Israel hastens the end of days; others simply feel attached to the city where it is said Jesus Christ was crucified and buried. 3. Israelis want peace — but many don't believe in a peace agreement. Israel's political discourse has been drifting away from the idea of "land for peace" — that Israelis should concede territory for a Palestinian state, which should then live in harmony with Israel. Some Israelis oppose a Palestinian state on national security grounds, because of past Palestinian attacks and the example of Gaza following Israel's withdrawal, or religious grounds, because they consider the West Bank part of the ancient homeland of the Jewish people. Netanyahu previously supported a two-state solution in theory but now voices many reservations in practice, referring to a "state-minus." His view resembles that of U.S. Ambassador David Friedman, appointed by President Trump. "A two-state solution would be a wonderful thing," Friedman told NPR, but only if it "doesn't threaten Israel" and other nations. Friedman cast doubt on that possibility, given the power of Hamas. 4. Hamas has suggested a truce — but still rejects a Jewish state. Gaza is ruled by Hamas, dedicated to the elimination of Israel in favor of a Palestinian state. The United States calls Hamas a terrorist organization, but it won elections in the Palestinian territories in 2006 and took control by force of arms from the Palestinian Authority in Gaza in 2007. A Hamas official, Ismail Radwan, suggested to NPR that Hamas has moderated its goals, accepting a Palestinian state on land that Israel occupied in 1967. That suggests Hamas is resigning itself to the existence of Israel — a two-state solution, also favored by Fatah, the other main Palestinian party and the mainstream faction. But when questioned, Radwan conceded that Hamas has not changed its basic position. "Hamas does not recognize the Zionist entity," he said, "because it's an occupation." 5. Hamas encouraged unarmed protesters — but still believes in armed resistance. Accounts by numerous reporters indicate the vast majority of Palestinian protesters who approached a border fence around Gaza were not carrying weapons. Israel alleges that Hamas fighters staged armed attacks at two protest locations Monday but has made no such claim about 11 other protest locations where people tried to breach the fence. Israel's army says at least 14 of those killed Monday by Israeli troops were armed with guns and tried to attack troops — though this accounts for only a fraction of the number of Palestinians killed on that day. A Hamas official said in a TV interview that 50 of those killed were members of Hamas, but that does not mean they were armed. Regardless of the precise tactics Hamas used on Monday, it still has a militant wing with bases in Gaza, and its leaders still maintain that armed resistance is legitimate. 6. Israelis have a strong national identity — but it's not the only one within the land Israel controls. Israel was founded in 1948 as a refuge for a people who had been exiled and oppressed for nearly 2,000 years. Its army defeated the armies of its larger neighbors. Its agents hunted down Nazis who took part in the Holocaust. To this day, Israel maintains the noisiest and most open public life of any country in its region. But Palestinians offer a similar narrative — one of dispersion from a homeland and a yearning to return. One people's possession of a historical homeland led to the dispossession of another people. And when one nation — Israel — was born, another national movement fought to be born, too. The two irreconcilable narratives are what make it so hard to imagine an end to generations of conflict.